Land of dreams, the United States of America, is a huge nation which spans most of North America, covering a staggering 3.8 million square miles. The 4th largest country in the world, and 3rd most populous, the USA is composed of 50 states, a federal district, and 5 self-governing territories. Its sheer size makes a vacation to the USA a great choice for those looking for a large variety of activities, landscapes, and cultures. With environments ranging from the beaches of California to the forests of the Atlantic seaboard, the Appalachian Mountains, the Great Plains, and the Mojave Desert, the USA contains a whole world to discover within its borders. The capital city and seat of government, Washington D.C., is situated on the East Coast, although the largest city by population is enigmatic New York, a must-visit destination on a tour of the USA, bursting with culture and countless recognizable sights, immortalized in movies and television shows. Other major cities that should be included on a vacation package to the USA are the so-called City of Angels, Los Angeles, charming San Francisco, and the ‘windy city’ of Chicago. In contrast to the metropolises of America’s mainland, the islands of Hawaii delight visitors with their natural beauty and laid-back atmosphere. Admired for its Hollywood film industry, diversity and stretching landscapes of its interior, a holiday to the USA is an opportunity to lose yourself in the wild plains, walk in the footsteps of the stars and explore the land of the free. The territory of modern-day America has been inhabited for approximately 12,000 years, it’s first inhabitants are thought to have been Paleo-Indians who crossed from Siberia on ice-sheets during the last Ice-Age. In more contemporary history, the story of the USA as we know it today began in the 16th century when European colonists voyaged across the Atlantic to settle on the East Coast of the giant land mass, forming the first communities and cities in America. Conflicts between British settlers and Patriot colonies, in alliance with the French, resulted in the violent American Revolution and the Declaration of Independence in 1776, marking the beginnings of the United States of America. This made the USA the first country in the world to gain independence from European powers. By the end of the 18th century, the Constitution and Bill of Rights were adopted, granting its inhabitants a series of fundamental civil liberties. Over the next century, intrepid American’s continued to expand westwards, acquiring new territories as they journeyed further but also displacing many Native American tribes as a consequence. 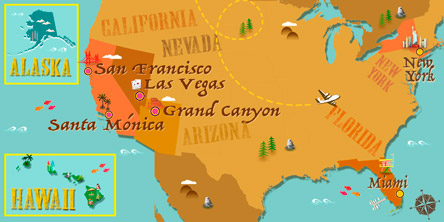 By 1848, the whole continent from the Atlantic to the Pacific had been discovered and the Californian Gold Rush began. The pivotal events of the Civil War and Abolition of Slavery followed, and by the 20th century, industrialization had engendered an impressive economic boom. By traveling across the country on a tour of the USA, you have the opportunity to trace the fascinating and complex history of this great power. Involvement in both WWI and WWII cemented the USA’s status as a global superpower and the second half of the 20th century was marked by the Civil Rights Movement of the 60s and the ‘Space Race’, with the USA successfully putting the first man on the moon in 1969, spelling a golden era in American history. With the fall of the Berlin Wall and the collapse of the USSR, the long-lived Cold War came to an end, earning the USA the status of the sole world superpower. It is still true that this enormous country occupies a significant space in world politics and culture, therefore traveling to the USA is a fantastic opportunity to get to know its history and significance for yourself. Unsurprisingly for a country of its size, the USA is home to a dizzying range of landscapes and climate zones. It is classified as a ‘megadiverse’ country, meaning that it contains a significant percentage of the worlds animal species and had a large number of endemic species too. For travelers looking to explore great open spaces and wilderness, a trip to the USA is a perfect choice, once you venture outside of the big cities and popular resorts. 59 National Parks help to keep the country’s impressive ecosystem protected and offer a wonderful array of landscapes and a chance to get in touch with nature. Yosemite National Park is perhaps the most famous reserve of all, renowned for its ancient sequoia trees and the stunning Sierra Nevada mountains. It is well known that the United States is brimming with natural wonders, from the scorched Death Valley in the Mojave Desert, the lowest and driest place in North America to the gushing Niagara Falls. The Giant Redwoods of California attract travelers who want to come face to face with the tallest trees on the planet. Arizona’s Grand Canyon, carved into spectacular shapes by the Colorado River, is a popular destination for helicopter tours, whilst the enormous Mississipi River spans an impressive 3,778 kilometers through the country from north to south and hosts a range of leisure activities both on the water and along its banks. The lush everglades and dreamy beaches of Florida, make the state one of the most popular holiday destinations in the country. Despite the huge population of America, there is plenty of room for the nation’s wildlife to flourish and it is home to more than 400 mammal species. The western states play host to a rich array of wildlife, from brown, grizzly and black bears to coyotes, raccoons, mountain lions, and even jaguars, not to mention the national bird, the bald eagle, so this region is surely worth a visit during a tour of the USA, if only to explore it’s wide open spaces and untouched nature. With a recognisably Western culture, the USA’s cultural exports have spread across the world in recent decades due to globalisation and mass media, although the diverse nature of its people, a result of large scale migration, ensure a rich cultural landscape and a fabulous mix of cuisines, festivities, and traditions, not to mention music and arts scene. Of course, the original culture of the colonists who founded the United States was adopted from the British, as seen in the country’s language and legal systems, but today Latin, African and Asian cultures are also prevalent. Aside from the omnipotence of the American film industry, music is another integral part of the cultural landscape in the States, with world-renowned names such as Elvis Presley, Frank Sinatra and Michael Jackson finding their success in the USA. The importance of national celebrations is another of the cornerstones of American culture, with Thanksgiving and 4th of July celebrations being amongst the most important dates in the calendar. If you’ve ever dreamed of visiting the sets of your favorite movies, walking in the footsteps of the stars or want to experience the multiculturalism of the country's biggest cities, a holiday to America can fulfill these dreams! It’s global importance, inspirational history, and exceptionally diverse landscapes, people and states make a tour to America a fascinating journey, on the list of almost every traveler. From the sweeping skyscrapers of New York to the Mojave Desert and the snow-capped mountains of Alaska, there is something for everyone in this vast nation. An ETA (Electronic Travel Authorisation) must be obtained online before travelling: https://esta.cbp.dhs.gov/esta/ Price approx $14.00. UTC - 05:00 to UTC - 10:00. Units of weight and measurement are different.